Attached is a file FSXKML_Samples.ZIP which shows how to accomplish various tasks in FSX KML. All the samples are located around the small resort island of Boracay (Philippines). Caticlan airport (RPVE) is located about 1 km to the south. Q) How to build an extrusion bridge? A) See the "ExtrusionBridge" folder FSXKML_Samples.KML which shows how to build an extrusion bridge. Notice that I bury the end points of the bridge about 20m under the ground. This is necessary so that FSX clips the bridge at ground level. Eh, by various samples you mean only the extrusion bridge there is nothing else there beside the bridge. I was hoping to see how to "redesign" an island. I had just that in that particular order (see my thread "Island showing as pure shoreline"). The only exception was that my exclude was tagged "Exclude All" yet only the shoreline shows. 2. The shape of the island changed to that of some of the inner polygons. I think there is some effect being passed forward? I wonder if the reverse thing is working properly. I removed the "Reverse order of points in polygon" and then my island shows up. If I remember correctly I define all my polygon points in an arc going from left to right. Also noticed that even though I had "White Coral Sand" it shows as tan sand from mid distance and when you get close it changes to an ugly grey. Is there a way I can add my own sand texture? got a tip for a good photoreal tutorial where I can use a satellite photo of the island? to overlay the island. It is not clear to me how that works, if you just put a photo or define polygons and background photo. 3) created the outline of my island using Polygonhole. The excludes are bigger than my island hole. You can see that an entire rectangle of land is now showing as a result of my exclude. Do I need to fill that water back in myself? If so, how? How will I know how much extra water to draw in myself? I am attaching my KML in hopes that someone can help. 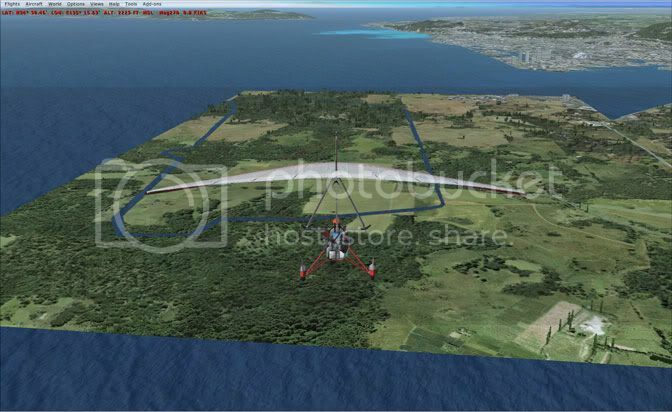 Build your BGL and have a look at what FSX has done. You should see that it has excluded water (ie exposed the land) for a much larger area than the polygon you drew. The is because FSX is excluding all the water for the QMD11 cells that your exclusion polygon touched. 3. Ok, you've got your harbor back, but what about the island the airport is on? This is where you draw a polygon around the island and tag with Polygonhole. This will cut a hole in the preceding polygon (ie the water polygon you drew in step 2) and thus expose the land that comprises the island. In this instance FSX will exclude water polygons whose bounding boxes overlap the bounding box of the exclusion polygon. Depending on location and geometry (of both water and exclude polygon) this MAY correspond to entire QMID11 (or not). Does excluding waterpolys and reinstating them cause the mesh to disappear? Thanks Lance. I excluded shorelines since they would allow the default landclass to show on the edges of the photographic textures. This is all I wish to do since the photographic textures define the shorelines implicitly. However I need to add the water poly otherwise the whole Qmid rectangle is covered by landclass ouside the photographic textures. How can I remove the default islands but keep the mesh? I haven't checked your KML and am not sure about your photoscenery, but to remove the default islands you should be able to just cover them with a water poly. The elevation mesh should still be there however the ocean should appear flat since it doesn't affect water polys. If you want the elevation mesh to affect your photoscenery I would think you would need to have land (not water) under the photoscenery. When I have done photoscenery I leave the default land as is, and the photoscenery is simply "draped" over the elevation mesh. For example, here's some photoscenery of the area around Kathmandu Nepal. I think you would need to redo the shape of the coast. Exclude water and shorelines then put water and shorelines back in the correct shape (so that they match your photoscenery shoreline). Thanks Matthew, I am not prepared to go to so much trouble. Don't know if it would work or if you'd want to go to the trouble, but I'm curious if small polygons with the ocean water tag juct covering the "bleedthrough" areas would get the job done. If so, the original KML file to exclude the shorelines would suffice, without the additional large poly that's flattening everything. I don't understand why there would be bleed-thru. If you remove everything from your addon scenery folder except the photoscenery bgl, how does it look then? When ive done photoscenery for a coastal area there is no bleed thru of underlying FSX shorelines/landclass. Maybe something (ie whatever you did with the KML) in your addon scenery folder is causing the problem. The screenshot above has no exclusions, only the photographic texture bgl. It isn't perfect. Because the coastlines are missing, parts of the sea climb the mesh, but it is acceptable for me. Thank you. So I have to determine the shape of the remainder of the GMID11 and re-create all of that water? I wish there was a way to get the FSX geometry back into GoogleEarth so I have a reference for digitizing. I had to reread your reply, but now I "get" it. My problem is that I'd like to import the shape from FSX to make sure that my poly lines up with the existing polys. I don't think my digitizing in GoogleEarth will exactly line up with the polys in FSX. Any insights or does everyone just "eyeball" this and resort to trial and error? I realize the ACES guys were using ESRI ArcGIS to get all of this data in (hence the shape to BGL tool), but I wish there was a way to get the shape (or KML) out of the BGL. Is there some obvious tool out there that everyone is using?